Here’s a fun art project that has a little of everything – some painting, a little experimenting with a new technique, cutting, gluing, and drawing. 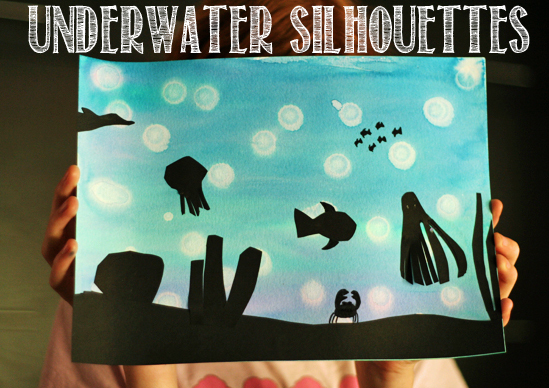 These underwater silhouette paintings start with a watercolored background, plus a little rubbing alcohol to make a bubbly effect. 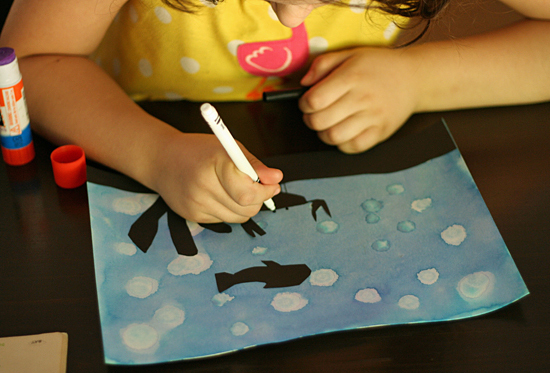 Then, paper and marker silhouette shapes are added to complete the underwater scene. The first step is to paint a cool and watery background. 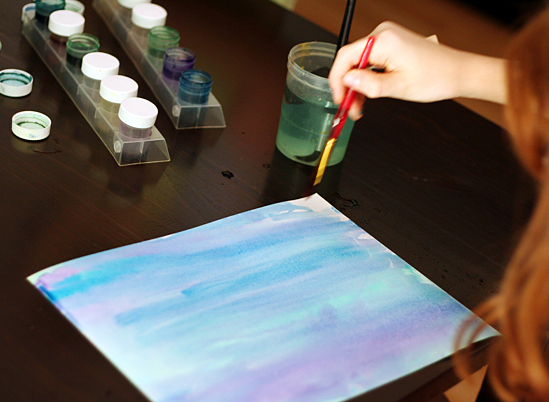 We wanted our colors to mix and swirl together, so we started by wetting the watercolor paper with plain water first. 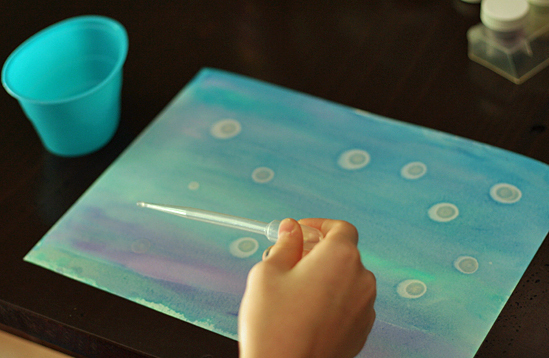 Then, add your watercolor paint (liquid watercolors or a pan of watercolors work equally well). We stuck with cool colors for our ocean background – blues, purples, and a touch of green. For a neat bubble effect, we dripped rubbing alcohol on our background while it was still wet. Apply the rubbing alcohol with a pipette or dropper. Make sure your work area is ventilated, since the rubbing alcohol is stinky! Set your background paper aside and let dry completely. Then, it’s time to add some underwater silhouette shapes. 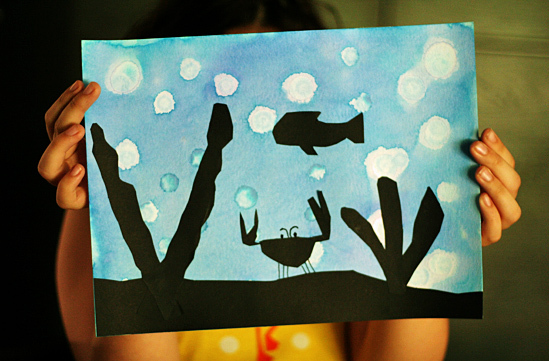 Cut seaweed, fish, sharks, rocks, and other underwater creatures and plants from black construction paper. Use a glue stick to attach to your background. Use a black marker to add smaller details, like tiny fish or crab eyes. Isn’t the finished silhouette artwork striking? I love them! 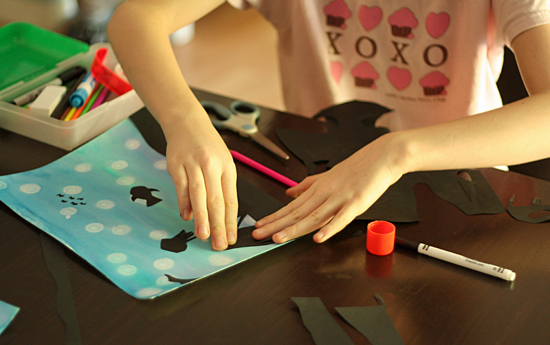 My girls are planning a sunset silhouette with a warm color background for our next project – sounds fun to me! Happy creating! These are so fun! I’ve done the watercolor background before, but never with the drops of alcohol. I like that idea.